Tuva—can back up such praise. He's a master of khoomei, or throat-singing, a musical style that allows a singer to produce overtones—two, three, or even four notes at once—and specializes in a rare deep-bass variant called kanzat kargyraa. A founding member of the traditional Tuvan group Huun-Huur-Tu, Kuvezin left to pursue his own muse in his band Yat-Kha. He's hardly shackled by traditionalism, and has spent his career seeking bridges to other styles of music, including the American rock he collected as a teenager. Kuvezin unleashes his wild vocal style on a set of those tunes on's latest disc, Re-Covers, interpreting songs like Motörhead's "Orgasmatron" through his guttural bellow. (See Yat-Kha's website to download mp3s of "Orgasmatron" and the band's take on Joy Division's "Love Will Tear Us Apart.") There's no denying that Tuvan throatsingers like Kuvezin are an acquired taste, but really, could the world's second unique voice be anything else? The A.V. Club navigated the overloaded Tuvan cell-phone network and an 11-hour time difference to chat with Kuvezin in Tuva. The A.V. Club: How did you become a musician? Albert Kuvezin: It was a long way. I had started to play in the band about 16 years old in school, and then after I finished school I decided to become a professional musician. I studied music at college in our town, to work in different bands, not only rock music but traditional. And at the same time, I wanted to find my own style, a niche between traditional Tuvan music and rock 'n' roll. In those days it was my main idea. AVC: How difficult was it as a teenager in Communist-era Siberia to find records by Deep Purple and Joy Division? How did you even get the records into the country? AK: Between a very close circle of friends, and also we bought records from black-market dealers. I think they brought them from Moscow or from Vladivostok, a big Pacific coast city. I think they got them from sailors in Japan or somewhere, so we could get records on vinyl and tapes from them usually. AVC: When you first began playing rock, how did the people in charge react? AVC: Was traditional Tuvan music also frowned on? AK: It was not officially forbidden, but was not very much welcomed to the professional stage. We didn't have a possibility to study traditional music in music school. There was only one school in the city where they taught in the Tuvan language. We learned Russian music, and of course Western European classical music, but nothing from our own Tuvan culture. I think that was the biggest problem of Communists—they didn't care about the cultural life [of] aboriginal people, here especially in Siberia. Maybe it brought them to collapse. AVC: Of the prominent Tuvan musicians like Huun-Huur-Tu and Kongar-Ool Ondar, you seem the most interested in merging traditional Tuvan styles with Western rock. AK: Not only with Western rock. . In the beginning that was my idea, but when I started to travel a lot and play different festivals, meeting people from different parts of the world, I began to get interested in different music. So right now I try to make a new synthesis of music from different [regions]. Not only rock 'n' roll; it could be any kind of music. AVC: The inspiration to record the Western rock songs on Re-Covers came during an actual period of recovery after a car accident, when you were recuperating and began listening to older albums in your record collection. AK: That's right, and also I think I was tired of playing the same music for many years. I just wanted to refresh my ears, my mind, and I started to go through my record collection and found so much music which I loved from my teenage [years that I hadn't heard] for maybe 20 years or more. I found that it still sounds even modern today. Some tracks reminded me of Tuvan melodies. They were similar, also kind of soulful. I just tried to play this music in my own way. AVC: Were you concerned that covering bands like Motörhead or Led Zeppelin might make people think you were just goofing around, not taking the music seriously? AK: I always try to be ironistic in everything I do. I love people who understand humor and who live through humor. So, of course, I was not too serious covering such things as Motörhead or "Black Magic Woman" by Santana. But I was serious enough [about] Led Zeppelin and the Celtic song "Wild Mountain Thyme." In my life, serious and humor are always together. AVC: Your style of throatsinging, kanzat kargyraa, is somewhat unusual in Tuva. AK: My style is based on the traditional Tuvan style of kargyraa, but I have developed a little bit of a new way, more rocky. It is actually unusual even for Tuva. But at the same time, I have heard so many singers from other parts of Siberia who used styles similar to kargyraa but doing epic stories, fairy tales using a kind of musical declamation. I think [my style] is between kargyraa, rock, and this epic storytelling. But right now I'm trying to develop, like, just normal singing, which of course maybe sounds horrible for Western ears. AVC: You mean not to sing in a throatsinging style but in a Western mode? AK: I want to sing using a throatsinging style, like for example kargyraa, but at the same time sing it like a normal way. Maybe I will try some opera. To sing a melody, and to sing not only Tuvan traditional melodies, but I would like to try Western classics, blues. I think Tuvan music and American blues are very close to each other. AVC: Your band plays a mix of Tuvan traditional instruments and Western instruments. Can you tell me a little bit about what you play? AK: Usually in the studio, we use many instruments, not only Tuvan ones. My instrument in the band is the igil, a two-string bowed instrument with a skin top deck. Each string consists of many hairs so it looks like fiber-optic cable, so it is a very special sound because the many hairs give a lot of overtone harmony. Also we use a Jew's harp, a mouth harp, which in Tuvan we call khomus. Also different percussion and drums not only from Tuva but from many parts of Asia. We also use a doshpuluur, which is an instrument similar to a banjo but only with two strings. 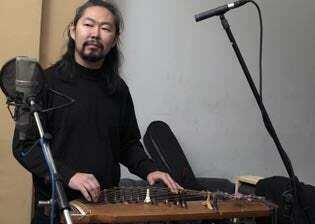 We have an instrument that looks like a Japanese koto, which in Tuvan is called a yat-kha. AVC: That's also where you get the name for the band, right? AK: Yeah. [We might use] could be any instrument that sounds interesting to us. On the last album you can hear Arabian, Vietnamese, African, and Eastern European instruments, and violin. And of course electric guitar, bass, and acoustic guitar—those instruments became traditional for many countries, I guess. Guitar became the traditional instrument in African countries like Mali, Senegal, Tanzania, and of course in Russia. In Tuva, it's one of the main instruments. AVC: In the liner notes to Re-Covers, you mention that you think of the Kraftwerk song "Man and Machine" as a modern folktale about our relationship with the machine world. AK: [Laughs.] I think people understand that's [meant] ironically. Because we are too much in the machine world today. Even here in Tuva we've got every year more and more cars [and other] technologies, and of course it brings more pollution to our air, to nature. And I think [the idea of the Kraftwerk song] is people [should] not be very much mechanized or to be a machine in the world of machines. The idea is to try to find a golden middle between the world of nature and the world of machines. AVC: Tuvan music is often based on the sounds of nature. AK: Especially old traditional music. Singing, playing mouth harp, playing igil, or even playing shamanastic drum, it is an imitation of sounds of nature. AVC: Since you do synthesize other styles with Tuvan music, do you think your music still has that connection to nature? AK: Yes. On this particular record, I tried to use more acoustic instruments. For me, acoustic instruments still come from natural sounds. All this material [used to make the instruments] was taken from nature—wood, skin, hair. And I still believe that Tuvan nature gives me a lot of energy and support to continue my rock and to be strong in this world. And I will always come back to my homeland. We're lucky that we still live within the nature—even our main city, the capital Kyzyl, is situated between the mountains and steppe, and from my home in just a few minutes I can go by foot to the steppe and smell the fresh, wild grass. AVC: What are your plans for Yat-Kha's American tour? AK: In September we're coming to the U.S.A., and one of our main projects is a concert together with the Chicago Symphony Orchestra [Sept. 14 in Chicago, Sept. 16 in Milwaukee]. And of course, we'll do our own gigs as well. We have not been in the States for maybe four or five years. It's a huge country, and a very important place for musicians to prove themselves. AVC: Do you have plans to record with any American musicians while you're here on tour? AK: Why not? I would be happy if I could meet some musicians interested in different acoustics and traditional music. Maybe I will find some Native American or Latin tunes. Anything. Even maybe a great heavy metal guitar player or drummer, and we can do something wild together. My next step is making more music without formats or borders. Not just simple songs or doing covers, but music with more ideas. I think it will again be a synthesis with something else. On the next record I'm going to invite more musicians of Siberian origin, from Mongolia, and also right now I am interested to write music for movies, or documentaries. I've got my portable studio right here [in Tuva]. I can record every day, every night, tracks and tracks, tunes and tunes. I've got a lot of material to be released soon.